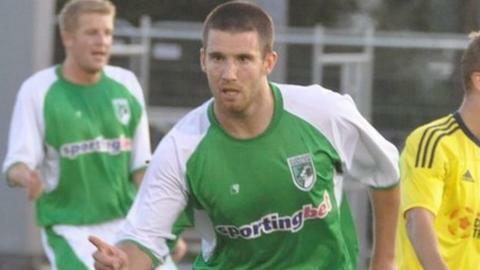 Guernsey FC top scorer Ross Allen hit five goals as the Green Lions came back from Croydon with a 7-4 win. Allen got all the Green Lions' goals as they went 4-0 ahead just after half-time before Croydon pulled one back. Allen converted a 65th-minute penalty before Croydon scored three in 15 minutes to scare the islanders. But Nigel Hutton scored twice in the final seven minutes to seal the win which moves Guernsey up to sixth in the Combined Counties Premier Division. "Somebody joked when we went 6-4 up that that's the first set to Guernsey," island boss Tony Vance told BBC Guernsey..
"We don't do boring games, it's a great three points and we were a lot more comfortable at one stage, but we let ourselves down for a mad 15 minutes and made it more uncomfortable. "But we deserved to win the game, no doubt about that." And while Vance was quick to praise Allen, who has taken his goal tally to 36 for the season, he says his side are much more than just a one-man team. "He's lethal and give him a chance and he'll generally take it," Vance added. "The key thing to say about Ross is that while he's the guy that puts the ball in the back of the net, and he does it very well, there's 10 men getting the ball to him and working hard to give him those position. "People might say we're a one-man team because of all his goals, but the boys work very hard to create opportunities for him to put it in the back of the net." Read more on Guernsey FC drawn away in the quarter-finals of the FA Vase.